We had a busy summer here at Google interacting with students through a wide variety of scholarship, internship and networking opportunities across North America. Here's a look back at a few of our programs (you can bet we'll be hosting them again!) along with news on some upcoming initiatives. 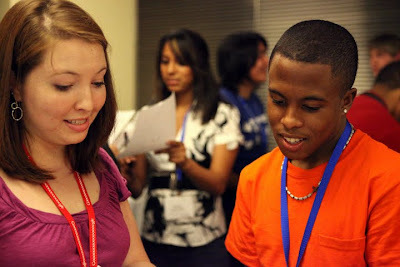 Rising college sophomores participated in two Google programs: Google FUSE, in its inaugural year, and the Google Computer Science Summer Institute (CSSI). For FUSE, we welcomed 50 rising college sophomores to our New York City office for a three-day retreat designed to connect students from groups that are under-represented in the field of computer science. The retreat focused on making connections between students and Googlers, encouraging students to create meaningful academic experiences and allowing them to learn more about possible career paths via hands-on activities, panel discussions and a bit of fun around the New York City area. Another group of twenty rising sophomores spent two weeks at the Googleplex in Mountain View for the second annual Computer Science Summer Institute. This special program included an interactive and collaborative Computer Science curriculum, as well as a living-learning residential experience for student networking. Students worked in teams to create an interactive web application using Python in Google App Engine. When not in class, they heard technical talks from Google engineers, spoke with professionals from across the technology industry and academia about the many things they can do with a Computer Science degree. They also had some fun joining the Bay Area summer interns on a boat cruise and catching a baseball game after an exciting San Francisco scavenger hunt. In addition, our engineering internship program hosted more than 450 college (undergraduate and graduate) interns in 15 locations across North America. These interns were an integral part of the engineering team and made significant contributions this summer working on exciting projects including Android, Chrome, Docs and machine translation. We also had more than 100 students working across multiple functions, including sales and engineering in Mountain View, New York, Chicago, Ann Arbor, Washington, D.C., San Francisco and Boston as part of the Building Opportunities for Leadership and Development (BOLD) Program. BOLD is a 10-week internship program designed to provide exposure to the technology industry for students from groups that are historically underrepresented in technology. This summer experience includes a unique glimpse into a business or engineeringcareer, professional development and leadership courses, as well as one-on-one mentorship designed to further support professional growth. Of course, we realize that growing future leaders in engineering and business doesn't just start with college students. For this reason, we partner with the LEAD programs in both businessand engineering to encourage outstanding high school students to pursue careers in these fields. This year, all four LEAD Summer Engineering Institute participants had the opportunity to tour a local Google office to attend technical talks and interact with Google engineers (okay, with some tasty food and video games thrown in as well). As part of Google's ongoing commitment to recognizing student achievements and promoting leadership, we also offer a number of academic scholarships. We are currently accepting applications for the Google Lime Scholarship for Student with Disabilities in the U.S. and Canada, and the Anita Borg Scholarship in Canada, Europe, the Middle East and Africa, and the United States. In case you're curious, we offer a host of scholarships for many other international regions. If one or more of these opportunities sounds like something you'd like to participate in, you can find applications for full time opportunities and summer internship opportunities on ourstudent job site. Visit our scholarship page for more information on our scholarship opportunities. And follow us on Twitter and Facebook for updates on application deadlines and new program announcements. Making an early connection playing People Bingo at Google FUSE. 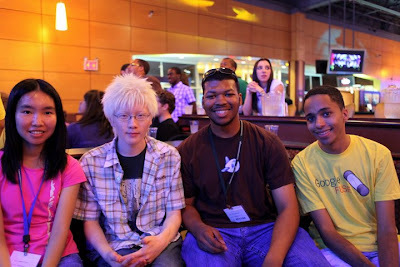 Taking a break from bowling during Google FUSE. That's awesome all the programs in US, but i have a question when we can have all this amazing programs en Mexico.I´m a student of engineering in UNAM(National University Autonomous of Mexico) i want to be a Google Campus Rep. I have gone through this blog. I found it very interesting and helpful. Nowadays I am completing Engineering Course from a reputed college. And this blog really doing great for me. This blog also offers me more ideas concerned to my career.